Fashion Square opened an indoor farmers market. Winter Park’s, Eat More Produce, is offering fresh fruits, vegetables, a deli, free-range eggs, home made granola, and specialty foods every Saturday and Sunday in the mall’s west court. Fashion Square was recently purchased by UP Development. They are the same people behind the Shoppes at Alafaya Trail and Millenia Plaza. There are other changes going on in the mall and a spokeswoman indicated that they are in discussions with Bath and Body Works to reopen its newest retail prototype next year. This is a great thing for Winter Park and is one of the only indoor farmers markets in the area that will provide everyone a comfortable and cool place to shop for fresh fruits and vegetables, as well as prepared fresh daily salsas, guacamole, and hummus. This indoor market will be a nice addition for Winter Park. 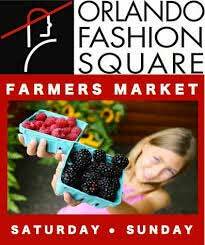 The Farmer’s Market near the Winter Park Historical Museum is a large marketplace with over 50 vendors year round and with the addition of the one at Fashion Square there are now two choices Saturday and Sunday for finding those perfect fresh fruit and vegetables for the family. There’s nothing better then fresh from the farm and when it’s warm outside, combine your mall trip inside cool Fashion Square, and shop for fresh fruits and vegetables before going home. Don’t forget to pick up some of the freshly made daily salsa and guacamole for that next barbecue.